How about taking your little one on a free trip to the tropics this winter? A walk through the gorgeous glass Saskatoon Civic Conservatory is like a quick tropical excursion, without the worry of sunburn. How luxurious it feels to walk among orchids and other tropical plants while simultaneously peeking out the floor-to-ceiling windows to the white-washed Saskatchewan winter. If you and your little one are up for more, you both will enjoy the unique shapes and colours of the adjacent Mendel Art Gallery's winter exhibitions. If not, you will definitely want to plan that for another day's adventure. Just make sure you schedule in time to treat yourself to a toasty mugged beverage or a light lunch in the Mendel's Museo Café! This is a great place to schedule a date with a new "Sask mom" friend and baby or even a quiet work-week lunch date with a non-parenting friend you haven't seen a while. 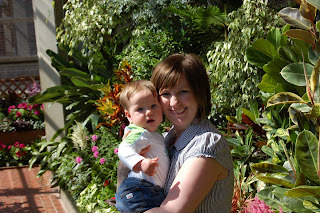 I love that the Saskatoon Civic Conservatory and Mendel Art Gallery are so accessible! With free admission, great hours (9 a.m. to 9 p.m. daily), stroller accessibility and change tables, you could even make this a weekly adventure!